Has Microsoft been looking at user files to find the 75TB OneDrive hoarders? Is Redmond failing to respect user privacy? 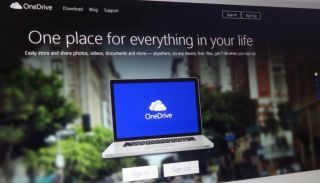 Thanks to a "small number of users" taking up more than 75TB each by backing up "numerous PCs" or uploading their "entire movie collections and DVR recordings," Microsoft has reduced the amount of storage on OneDrive. Even users who pay for a subscription only get 1TB of storage, and free users get knocked back to 5GB instead of 15GB – Microsoft didn't even keep the old 7GB allowance it had before. The 'camera roll bonus' has also been ditched, so Windows Phone, iOS and Android users automatically uploading their photos and videos will have to make sure they stay under the limit or buy a subscription (4k video files created on the new Lumia 950XL are likely to use between 90-150MB for a minute of footage, depending on the codec). Groove Music (Xbox Music Pass) users will likely want to stop uploading their music for easy access from multiple devices. Free OneNote and Sway users will also need to watch their usage, as OneDrive is their only option for storing OneNote notebooks and Sways. What happens if they go over the limit? If you're using more than 5GB of free OneDrive storage when Microsoft drops the limit in early 2016 then you'll get a one-year subscription to Office 365 Personal free – but you have to give Microsoft your credit card details (and presumably remember to remove your files and cancel the OneDrive subscription before you get charged for the subsequent year). This offer makes it obvious that the drop in storage is far more likely a marketing deal for Office 365 than Microsoft actually having problems coping with all those backup files (especially given how often the company talks about how hyperscale its cloud data centres are). Even more so, when you consider that the OneDrive team deliberately picked a figure which is less than the average user stores as the free storage limit. According to the blog, the average is "14,000 times" less than 75TB – that's 5.4GB, making 5GB look nothing short of mean, compared to 15GB free on Google Drive, plus extra space for images. In fact, since this whole change is blamed on the users filling up 75TB of space, it's not clear why free users get less storage at all, unless Microsoft is giving up on the idea of using OneDrive as a loss leader to attract users from other platforms, with tools like automatic photo upload. But with the push to subscriptions, not even offering the option to pay for more than 1TB makes OneDrive far less useful for anyone working with large video files or extensive photo collections; they'll be better off paying for Adobe Creative Cloud or Flickr. If you want to back up to the cloud, pay for Azure Backup – or use a non-Microsoft service like Backblaze, which has unlimited storage for both personal and business plans. The reduced storage applies to consumer Office 365 subscriptions – Home, Personal and University. There's no word yet whether OneDrive for Business customers will also lose the unlimited storage they were promised last October but never actually received. The feature is still marked as Under Development rather than Cancelled. A Microsoft spokesperson told TechRadar that the announcement is only about the consumer service: "There isn't additional news about the Office 365 Business storage plans."